ROCHESTER, N.Y.—Shen Yun Performing Arts is a dance company on a mission, and on Saturday night the audience members at Rochester’s Auditorium Theatre became a delighted part of that mission. Shen Yun is working to revive traditional Chinese culture. Many of those who came out to the performance said it had a powerful effect. The culture was very authentic and felt very soothing, said restauranteur Amiel Mokhiber Jr., noting that Shen Yun left him feeling enlightened and uplifted. “They showed how society is supposed to be honest,” he added. “The song, the translation of the song, was beautiful that she was singing, about ‘this is what we are seeking. We are not seeking power and money, we are seeking this peace.’ That would be great for my life, for anyone’s life,” he said. The stories and values transcend times and cultures, Mr. Mokhiber said. Others were struck by the technical mastery of Shen Yun’s dancers. “What amazed me was, how they all moved together,” said Bill Hammond, a retired engineer. Sarah Freeman, a retired teacher, said she hoped it would open people’s minds to the common things human beings share. “Finding a way to keep us all honest and preserve our integrity and giving us a pathway to use as we carry on. There’s always going to be change, but we hope that change is always based on honesty and respect,” she said. Classical Chinese dance is one of the least known dance forms in the West, yet it is one of the most comprehensive dance systems in the world, with a history as long and rich as that of China. Passed down within the imperial palace and ancient Chinese theatre and opera, according to the Shen Yun website, classical Chinese dance has absorbed the wisdom of 5,000 years of divinely inspired culture. It is acknowledged for its great expressive power, and is composed of bearing, form, and technical skill. “There was no words to describe how wonderful it was. It just left you speechless, it left you wanting more. It left you just in awe of the performers and their abilities, and athleticism, and the talent of it all. It was just phenomenal,” said Amy Case. “It was very emotional, there were tears,” she said. Husband James Case said he saw beauty and peace in the performance. “It took me to a different place. It was nice to just see and hear, and feel, and forget about everything else,” he said. Mrs. Case said she will be struggling with the words to share with her sister what she had seen. “My sister knew I was coming and I thought, how am I ever going to describe this to her? There’s no way. There’s no words. There is no way to understand how beautiful that was. It was just amazing. We’d sit and we would be shaking our heads at how amazingly talented these dancers are. Incredible,” she said. “You have to see it because you can’t describe it, really,” said Mr. Case. 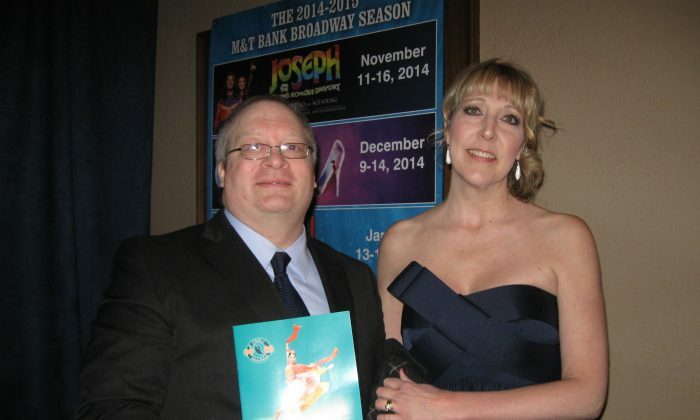 Jennifer Spacher said Shen Yun conveyed compassion, something that is needed today. “I liked the compassion. I liked that very much. I think that there is not enough compassion in the world, and I think it’s an excellent message,” she said. “I absolutely love it,” said Cynthia Smith, an insurance agent who was once a dancer. Her husband, Mark Smith, a business executive, said the show was more than he had anticipated. “I was surprised how imaginative it was. I was expecting beautiful dance and colours, but then as they brought the background into the live action, it’s just amazing what they have done,” he said. Shen Yun’s state-of-the-art animated backdrops are an innovation in the performing arts world, providing a fully immersive experience for the audiences—extending the stage to take them into the story being told. From heavenly realms to imperial palaces, natural landscapes, and more, the backgrounds are designed to “complement and synchronize all aspects of the performance,” according to the Shen Yun website. “The choreography is just beautiful, it’s tender at times and gentle, yet other times I can see the forcefulness and the drive that is being depicted through the story,” she said. “I hope that we can see it every year and I feel saddened that they can’t see this in China anymore; it really breaks my heart,” she added. Shen Yun was born out of a wish by Chinese people outside the communist-controlled country to revive 5,000 years of divinely inspired Chinese culture, a heritage all but lost in China today. Through its spectacular showcase of classical Chinese dance and music, Shen Yun introduces audience members to the essence of traditional Chinese culture, bringing to life its age-old beliefs and principles such as compassion and justice, propriety and wisdom, faithfulness, respect for the heavens, and divine retribution. As core values originating from the pillars of Confucianism, Buddhism, and Daoism, these virtues and ideals were in fact essential elements in the daily life of the ancient Chinese people. A central belief of the ancient Chinese was the unity of heaven and humankind, and people strove to achieve this oneness with the divine through cultivating themselves and continuously improving their moral character.